I hope everyone had a fun and eventful Halloween! Last Saturday, Alex and I went to our good friends’ Halloween party here in Orange County, which we also helped with setting up and decorating. I made a bunch of Halloween treats: homemade peanut butter cups, brown butter toffee cookies, rice krispy treats, salsa, and my forever party go-to, sangria. Sounds like a lot, but the only thing that required baking were the cookies, whereas everything else was more about the prep. All the work was worth it in the end, and all the snacks were definitely appreciated by the tipsy party-goers. On actual Halloween itself, we decided to stay in and take it easy. We made a delicious dinner of grilled steak with a corn/avocado/lime salad and watched two of our favorite horror films, The Shining and The Witch. While Jack Nicholson was busy losing his mind and breaking through a door with an axe, I was working on today’s recipe. I don’t usually shop at Whole Foods, mostly due to the prices, but I go every once in a while to try out specialty items that my favorite grocery stores don’t carry. Every time I visit, I always make sure to walk by the fancy chocolate table that has stacks upon stacks of pieces of Valhrona chocolates, cocoa powders, and other interesting products like chocolate féves (the latter which I just might splurge on for an upcoming cookie recipe). Although I feel like Augustus Gloop from Willy Wonka & the Chocolate Factory when I see this section, all of that happiness dissipates when I look at the prices and see that pretty much everything is $20.99/lb or higher. 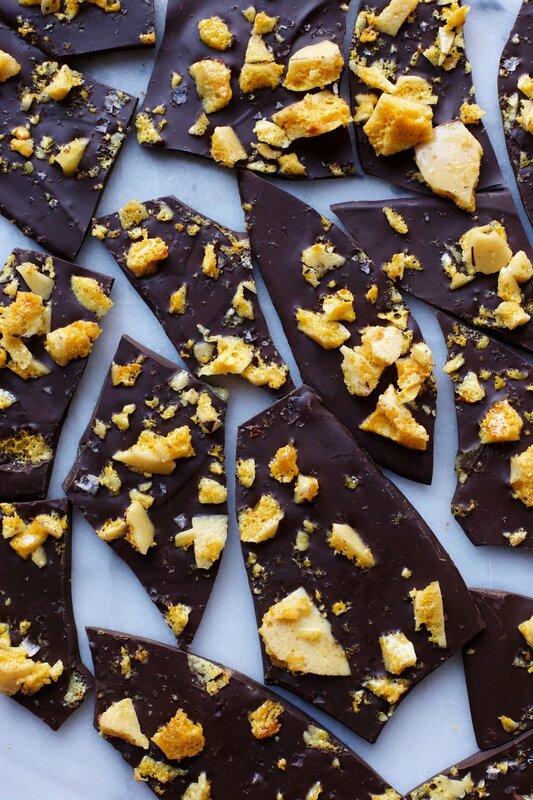 I usually walk away sad and empty-handed, but a couple of weeks ago I finally caved when I found a small (re: less expensive) piece of dark chocolate bark with honeycomb. I went home, had the bark for dessert, and even though I thought it was delicious, my immediate thought was that I could easily recreate this chocolate at home and save money in the process. 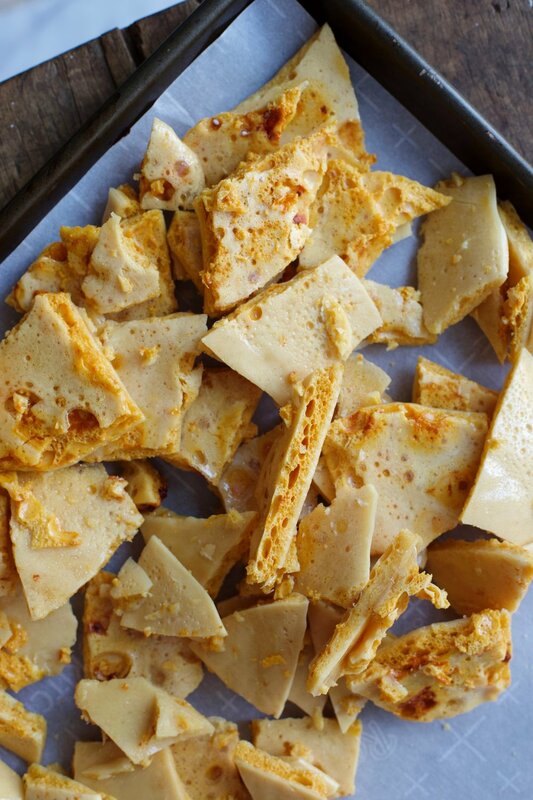 In order to make this bark, you’ll need to make your own honeycomb candy, also known as sponge toffee. With only 6 ingredients (2 of them being water and salt) that are most likely already in your pantry, honeycomb is definitely cheap to make and the whole process only takes about 10 minutes, plus about 30 minutes of cooling. Essentially, honeycomb candy is toffee but with baking soda added which creates bubbles and gives you the honeycomb look. The only tool that is vital to honeycomb candy success is owning a candy thermometer. The toffee needs to reach 300° F, also known as the “hard crack” phase, or else the candy won’t set correctly and you'll end up with a sticky texture. We’re looking for our candy to “shatter” easily. After the honeycomb is hardened and you’ve shattered it into pieces (a super fun step by the way), it’s all smooth-sailing from there. All that’s left to do is melt a pound of chocolate, spread it over parchment paper, sprinkle with honeycomb pieces, and finish with flaky sea salt (optional). Easy peasy. And I strongly recommend buying the Trader Joe’s One Pound Plus Dark Chocolate bar for this recipe! This massive chocolate bar is only $4.99 for 17.6 ounces of a very high quality of chocolate. Side note: I had Alex do a comparison between my honeycomb bark and the one I bought from Whole Foods, and he genuinely liked my version so much more, and even said that the chocolate in mine was amazing. I win! I’m sure you’re wondering why I’m giving a candy recipe now that Halloween has come and gone, and I have a perfectly good reason for this! Making a batch of this honeycomb candy would be a perfect host/hostess gift for upcoming Thanksgiving and other holiday parties. It’s much more thoughtful than showing up with a bottle of wine or flowers, plus it’s a treat that anyone can enjoy. Also, PLEASE GO VOTE ON TUESDAY. Or don’t forget to mail in your ballots! Please please please. I cannot stress enough how important these midterm elections are for us! Line a baking sheet with parchment paper and set it near where you’ll be making the candy. In a large saucepan, add the sugar, honey, corn syrup, and water. Without stirring the ingredients, cook over medium heat until the mixture reaches 300° F using a candy thermometer. Take off the heat and whisk in the baking soda. The mixture will be begin to rise quickly, so immediately pour it out onto the prepared baking sheet. Do not spread it out. Sprinkle on the sea salt. Allow the honeycomb to cool for at least 30 minutes before breaking it up into smaller pieces. Line a baking sheet with parchment paper. Melt the chocolate until smooth via a microwave or double boiler. Immediately transfer to the baking sheet and spread it out evenly with an offset spatula or butter knife. You can make the bark as thin or thick as you like. While the chocolate is still melted, sprinkle honeycomb candy pieces of all shapes and sizes over the chocolate. Finish with flaky sea salt. Allow the bark to set in the refrigerator until breaking it into pieces.